The Environmental Performance Index (EPI) is a method of quantifying and benchmarking the environmental performance of a country's policies. The 2010 EPI ranks 163 countries on 25 performance indicators covering environmental public health and ecosystem vitality. These indicators provide a gauge at a national government scale of how close countries are to established environmental policy goals. You maybe wondering how the scores are harmonised to facilitate cross-country comparison when different countries may have different policies. This is done through EPI's proximity-to-target methodology. Let's take a look at countries nearer to us and see how well we fared. 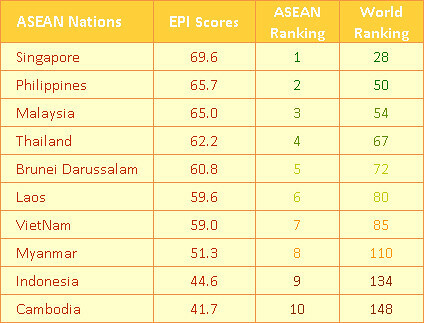 ASEAN countries are doing fairly well when compared to many other countries in Asia Pacific region with Singapore scoring just behind New Zealand and Japan. 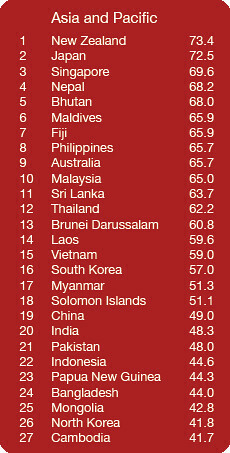 Malaysia makes it to Top Ten in the list. With the many green incentives, pledges and the countless on-going efforts towards greener environment by the current government, I believe Malaysia will leapfrog a couple of countries above it come next year's audit result. Judging from the works in place now, Malaysia should score at least 66 to 69 in EPI this year. My only wish is that the implementation of the FiT for four renewable energy sources is kicked of earlier by 4Q this year rather than 1Q 2012. So, which country is the world's greenest? The top spot for 2010 goes to Iceland due to its high scores on environmental public health whereby it gets virtually all of its power from renewable sources (hydropower and geothermal energy), and its water tight control of greenhouse gas emissions. Switzerland is ranked second followed by Costa Rica.